A separation agreement is normally drafted to reflect the terms of any settlement or agreement reached on the breakdown of a relationship. A separation agreement is legally binding. This means that should one of the parties involved in the agreement refuse to keep to the terms following its signature it can be enforced through the courts. Separation agreements are advantageous to both parties as they will normally stop one of the parties from later changing their minds about an agreement that has been reached. A separation agreement therefore safeguards your position as if one of you later refuses to keep to the terms of the agreement you can take the agreement to a Court and request the Court to enforce the terms. Enforcement means that the Court will take steps to ensure that the agreement is adhered to by the other party. This is because effectively the other party has ‘breached the contract’ between you. Remedies could include damages (cash payment), payment of your legal fees as well as the terms of the agreement being complied with. Many people choose separation agreements to reflect the terms of settlement rather than to proceed through the courts. A separation agreement is a cheaper and equally effective alternative to court action. 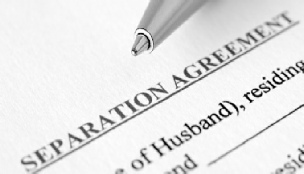 Separation agreements can be drafted to represent the position between anyone. Our specialist solicitors have drafted various separation agreements to reflect arrangements reached between ex-partners, family members and friends following the breakdown of a relationship. Separation agreements can include details on disposing of property, furniture, loans, bank accounts and any other assets. Many agreements also include financial arrangements made between the parties.